Kingsdown vs. Sealy Mattresses - Which Brand is Better? Two of the most recognized companies in the mattress industry are Kingsdown and Sealy. Both have been around for more than a century. However, there are numerous differences between the beds these businesses produce. Fortunately, I put in the work to compare Kingsdown vs. Sealy. Read on to learn how they fared. Since 1904, Kingsdown has been crafting mattresses in Mebane, North Carolina. In fact, when A.N. Scott and W.W. Corbett first opened the doors to the business, it was known as “The Mebane Bedding Company.” They have maintained their commitment to handcrafted quality ever since. Kingsdown is unlike other major corporations in that it is employee-owned. That means they do not have to answer to a group of investors who are just interested in making money. Instead, they have to answer to each other and their customers. Kingsdown has a wide array of product lines. Their innerspring mattresses feature a steel coil support system. Some have individually wrapped pocketed coils that diffuse any motion transference. Others just have a single unit of connected coils. Their innerspring collections include Sleep to Live, Haute Couture, Downton Abbey, Tradition, Passions, Handley, and Diamond Royale. The Kingsdown intelligent mattresses deliver support using air, active air, or proactive air technology. What is the difference? Air cannot be adjusted. Active air can be adjusted manually using the provided controls. And, proactive air adjusts intuitively to give you support while sleeping. These are the more expensive mattresses and include the Sleep Smart and BodyPerfect collections. The Sleep Haven collection is Kingsdown’s latex foam mattresses. They feature a resilient latex foam support system. There are also foam layers in various densities and shapes. With the goal of delivering sleep benefits and comfort levels, some are infused with gel. The Miro collection is a line of memory foam mattresses, which feature a conforming memory foam support system. Like the latex foam, there are foam layers of different shapes and densities that may be infused with gel to improve comfort and sleep. Kingsdown mattresses have a broad range of features, including personalized support, high coil counts, natural materials, airflow technology, and more. The Sleep Haven line has the ideal temperature feature. This combines gel fiber, performance fabric, and gel-infused foam to keep you at a perfect temperature all night long. Is Kingsdown Good or Bad? On the good side, Kingsdown mattresses rarely have an initial odor or any heat retention. Also, they have above average motion isolation. I had a great experience with the Kingsdown mattresses I tried out, but to provide an unbiased review, I took to the internet to see what others were saying. The main complaint was that some of the innerspring mattress owners reported the development of body impressions or sagging within the first three years of ownership. Fortunately, many of the beds have a ten-year warranty. When comparing Kingsdown vs Sealy, one of the big differences that will pop out at you is the price. As luxury mattresses, Kingsdown’s prices are in the thousands of dollars. Sealy is the second biggest mattress brand in the country. Since their founding more than 130 years ago, Sealy has introduced the game-changing Posturepedic mattress and created the Orthopedic Advisory Board. With patents for several paradigm-shifting technologies, such as Posture Channels and Pressure Relief inlays, Sealy is known for reinventing the innerspring coil and box spring. The latex they use is even a unique company patent. What Makes the Sealy Posturepedic Mattress Great? The Posturepedic series is what put Sealy on the map. In recent years, the product line has grown to include many smaller lines. The thread that binds them is that they are engineered to fully support your back and align your body to help you get asleep at night. There are four layers to these mattresses. For cooling comfort, there are climate treatments on the top fabric. Foam layers are next. The Sealy Embrace encased coils of the layer under that respond to the curves and natural alignment of your spine. Your lower back and hips are then supported by the CoreSupport Center. What Is the Innerspring Series? Quality textiles and quilting are used to make the mattresses in Sealy’s Innerspring Series. There are layers of soft, supple quilting with durable cover fabric that are designed to increase your comfort. These beds also feature gel foam for a cool sleeping experience. The memory foam produces body hugging conformance. You can choose from the Sealy Stability Coil or Classic Coil. The Stability Coil reduces motion transfer by individually encasing the coils. The Classic Coil supplies a combination of comfort and deep down support with its titanium alloy coils. Does Sealy Offer Gel Memory Foam? Yes. Yes, they do. In fact, they have an entire Gel Memory Foam Series that brings together comfort, value, and support. While providing a gentle cooling sensation, the gel memory foam has the ability to conform to your unique body shape and your weight. With the gel memory foam, you feel more like you are sleeping in the mattress than on it. It does this while keeping your body at a temperature that is great for restorative, deep, relaxing sleep. 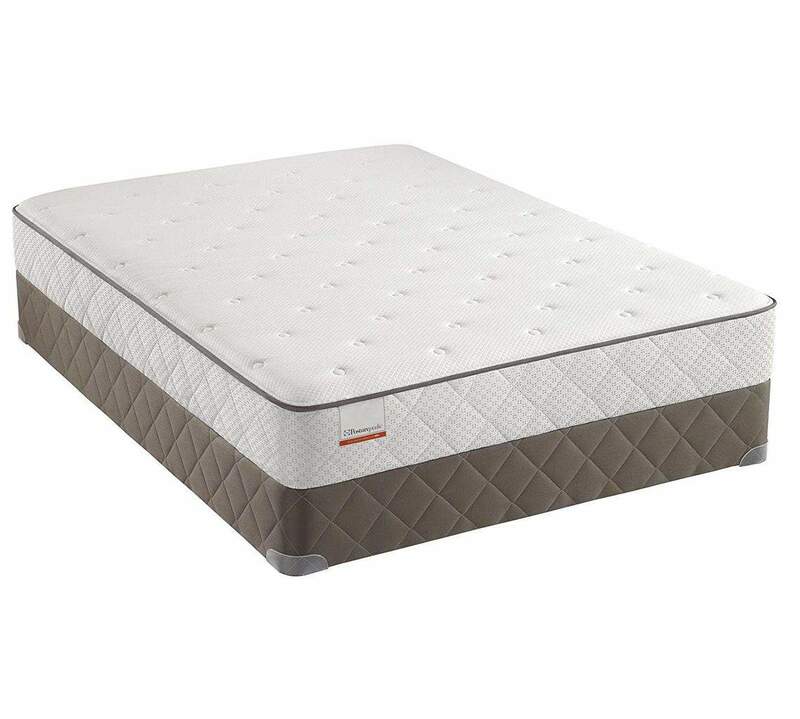 Below the gel memory foam is classic memory foam, which embraces your body to deliver support. The next layer is a Polycore support system that resists compression and offers proper body alignment. How Much Does Sealy Cost? As mentioned above, the price difference is what separates Kingsdown vs. Sealy. The Posturepedic and Gel Memory Foam Series begin at around $600 for a queen mattress. The Innerspring Series starts at $400. And, the luxury Posturepedic Premier Hybrid Series is about $1,300 and up. Sealy vs Kingsdown: What's the Verdict? Both Kingsdown and Sealy are quality brands, but if you must pit Kingsdown vs. Sealy, then Sealy is the better bed for consumers who want premium quality at an affordable price. Conversely, if you have a little extra money to spend and you want luxury, Kingsford is definitely worth the money.